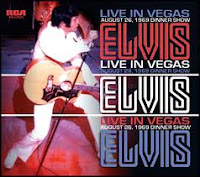 To think that it took 31 years before a complete concert from Elvis' first Las Vegas engagement was released (on the Live In Las Vegas box set in 2001). Now, thanks to Ernst Jorgensen and Roger Semon, no less than six shows has been made available to the fans, the latest one only last month on the FTD album Live In Vegas. Featuring the August 26 dinner show, it has been my companion to and back from work for a couple of days now, playing on my iPod. Feeling a bit tired at seven thirty in the morning, Elvis has woken me up on my way to the tram stop as he rocks through "Blue Suede Shoes," "I Got A Woman" and "All Shook Up." Fully awake, I've sat down aboard the tram and enjoyed my ride with the help of songs such as "Love Me Tender," "Heartbreak Hotel" (that have Elvis continuing the song as it's about to end) and "My Babe." Then there's Elvis belting out an incredible version of "Mystery Train"/"Tiger Man" so full of energy I practically jump of the tram at my stop. Reaching the University where I work, I open the front door to my faculty with a smile on my face as I listen to Elvis' entertaining monologue about his life and career. Nine ours later Elvis is back with more contemporary songs as I head for home, "In The Ghetto" and "Yesterday" among them. He even tries out one of his recently recorded songs, "Inherit The Wind". Approaching my apartment I once more feel energized with the help of the show stopper "Suspicious Minds." Why does Elvis always introduce "Memories" with the words, "A song I just did on my recent TV show, which wasn't too good, but you can't win them all." Didn't he like his NBC TV Special, or is it the song he has problems with? Or does he mean the poor chart position the song reached? On the other hand, his experience of singing dressed in a toxedo to a real dog on a stool on the "Steve Allen Show" he clearly remembered, describing it in great detail. It must have been humiliating. I just love the way Elvis sings "Mama..." and "Oh, I Can't..." at the beginning of two of the verses on "Inherit The Wind." Do you want to know more about Live In Vegas? Be sure to check out Tygrrius thorough review of the album over at the Elvis Australia web site. Great post, Thomas (and thanks for the link). Regarding "Memories," I used to always assume he was referring to the TV special itself, but a couple years ago, I read that Sam Phillips had supposedly told Elvis that he liked the '69 Vegas setlist except for "Memories." Maybe that comment stuck in Elvis' mind. On the other hand, I think maybe it was Kathy Westmoreland's book (if so, it's been about two decades since I've read it) where it was mentioned that Elvis didn't care for the production numbers on the '68 special. Hi Troy, interesting information about "Memories," thanks for sharing! Like you write, it's always hard to tell with Elvis, so in this particular case the real reason might never be known. It is hard to really know what Elvis meant. He was pretty bad at remembering dates or events so who knows.